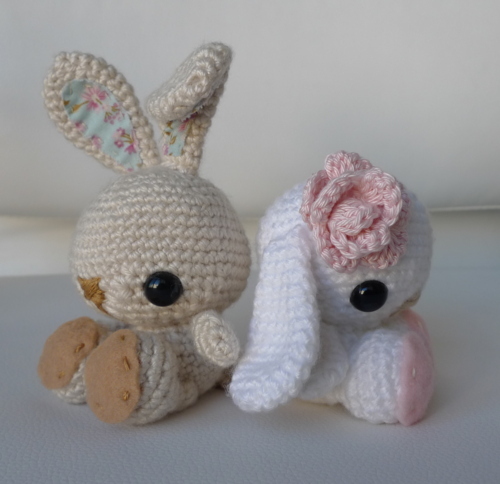 Since this past Tuesday was the first official day of Spring, I thought I would do a Crochet Corner post on my Spring Bunnies! I’m hoping the weather will be Spring-like, but we’re known to have unexpected blasts of winter where I live *fingers crossed*. It was also exactly one year ago when my first pattern for CRAFT got published on their website. 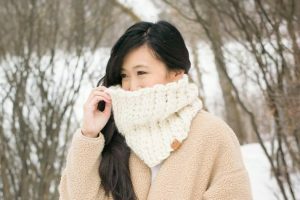 I was beyond thrilled when former editor-in-chief Natalie Zee Drieu commissioned me to design a Spring project even though I had only been blogging for two months. 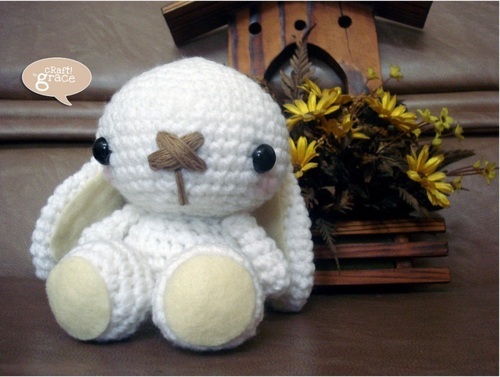 After it went live, Natalie told me that the Spring Bunnies pattern was extremely popular, and I’ve seen more final pictures of the Spring Bunnies than any of my other amigurumi designs! So, without further ado, let’s check out some Spring Bunnies that have been popping up all over the world! First up, we have Grace of Craft by Grace from Indonesia. 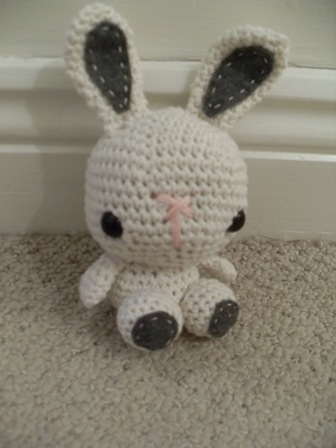 It’s neat because Grace used my “Amigurumi for Beginners” post and the Spring Bunnies project to teach some people to learn how to crochet! She started from the very beginning, teaching the basic stitches and how to read a crochet pattern. Below is Grace’s first Spring Bunny. 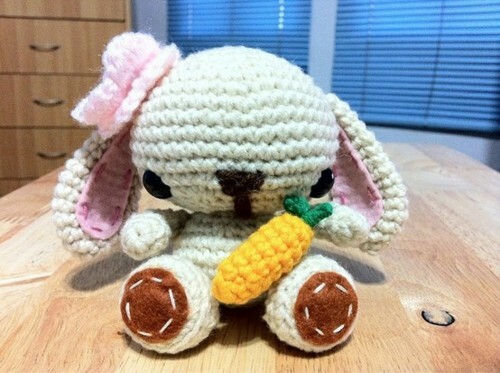 Grace taught Erni how to crochet, and here is her first ever amigurumi project! They took this picture during their last class together. Great job, Grace and Erni! You make a wonderful teacher-student combo! 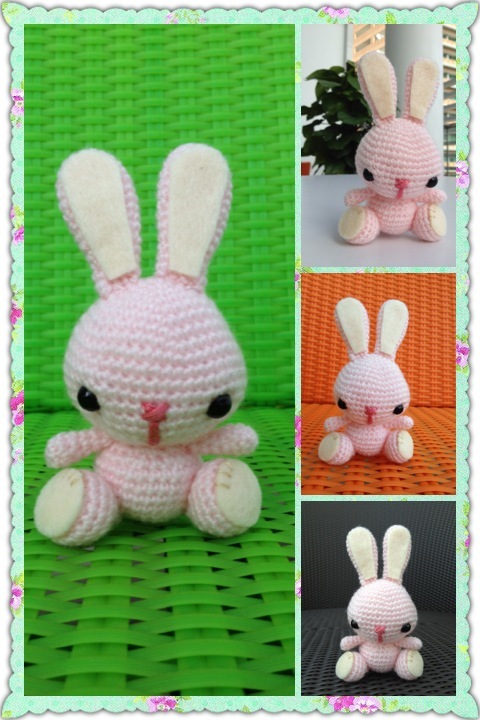 Oraflana made this beautiful pink Spring Bunny. I love how everyone chooses their favourite fabric for the lining of the ears, so each Spring Bunny looks very unique. What a lovely bunny! 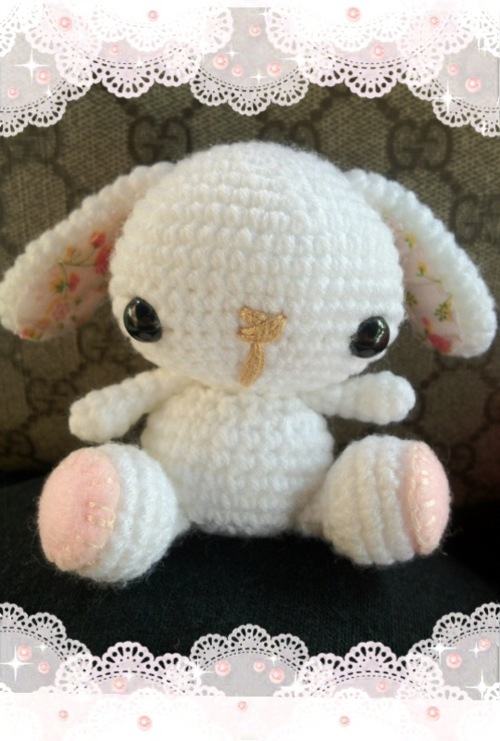 Christine of Oh So Pathos from Montreal, Canada made this bunny for her mom. Her mom was going through a rough period at work and wanted something "comfy and warm-hearted" to remind her that her job wasn’t everything and that there was more to life. Christine made her mom this bunny so that she could take a moment to breathe and relax whenever she saw it. 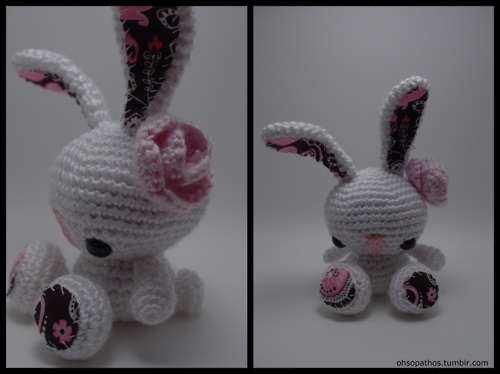 I’m sure Christine’s mom loves her handmade bunny and is always reminded how much her daughter loves her too! I love the funky fabric that Christine used and how black, white and pink contrast so nicely together. 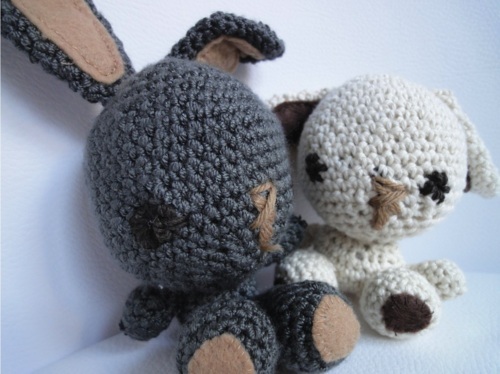 Hilary of Buzz & Lola from Ireland made her own Spring Bunny and plans to make him a smaller friend once she masters using a smaller crochet hook! People are always surprised to hear what a tiny crochet hook I actually use, but that’s how I get those tight, small stitches 🙂 I love the colours that Hilary used with the grey felt and pink nose on his cream body. He looks very snuggly and cute! Bogee made her own Spring Bunny with both a flower and a carrot- lucky bunny! Bogee found it difficult to sew the felt on the feet and ears, so she actually sewed the stitches on the felt pieces first and then used fabric glue to stick the felt pieces onto the crocheted pieces. What a great trick! 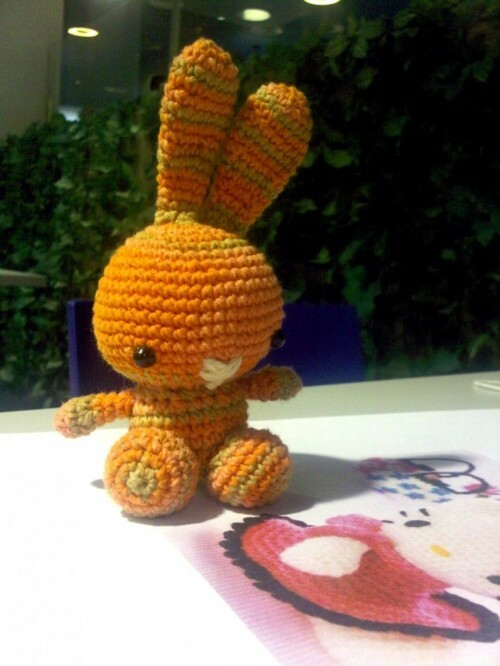 This bunny looks very well-made, and the stitching looks so even 🙂 Great work, Bogee! 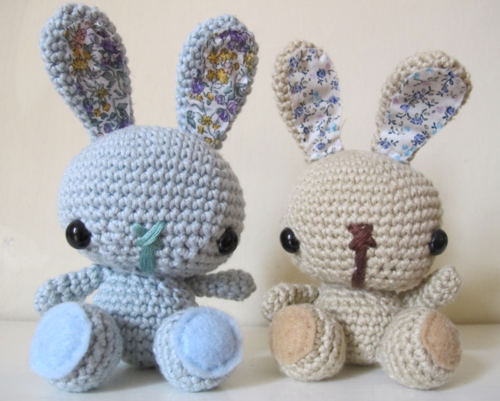 Candy from Singapore crocheted some bunnies and donated them to the Rabbit Society who is helping abandoned bunnies. I think it’s very sweet how these plush bunnies are helping their live counterparts in Singapore 🙂 Candy did a wonderful job with her pink bunny with ears sticking straight up! So adorable! And here is Candy’s floppy-eared bunny. Love the dainty floral fabric she used for the lining of the ears. What a sweetie! 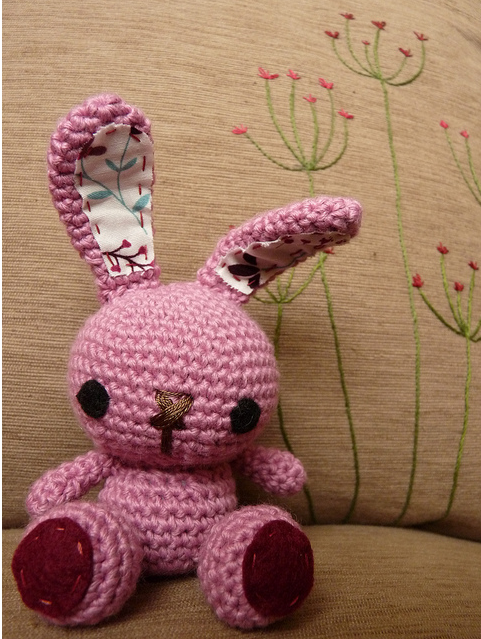 Victoria of YarnRoundHook from the UK made these two Spring Bunnies, Flower and Petal, for her two children. Victoria writes that they are so well-loved that some stuffing is even escaping! She also points out that Flower turned out bigger than Petal- it’s interesting even how a little difference in the weight of the yarn can make a difference in the overall size of the amigurumi. They both look very well-made and very cute, Victoria! I’m so happy to hear that Flower and Petal are getting so much love from your children!